This is the name for any procedure that is used to enhance and improve the appearance of your lips. There are several ways to enahce the lips. The majority of the procedures are performed using injectable products such as Restylane, Perlane and Juvederm as a lip filler. These have the benefits of being soft, natural and malleable giving some of the best looking results. There are permanent methods of lip augmentation that include surgical implants, the use of pharmaceutical grade silicone, and lip flaps (V to Y flaps). This depends on the method in which lip augmentation is performed. 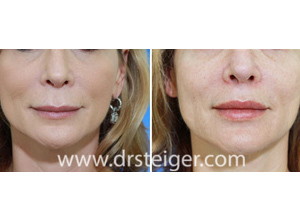 The injectable fillers (Perlane, Restylane, Juvederm, etc.) generaly last from 4 months to a year. Since the lip is a very mobile structure, the prodcut is broken down more quickly then it is in other parts of the face. Surgical methods and the use of the micro-droplet silicone injection technique is permanent. These procedures are very difficult to reverse. The majority of people start with the absorbable products prior to advancing to more permanent methods of corection. What about permanent solid lip implants? Since the lip is constantly moving and an exposed visible area, solid lip implants tend to be very noticeable to observers once the swelling subsides. This is especially true since the lips are a focal point of the face when you are speaking. 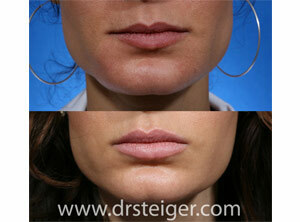 For this reason, Dr. Steiger prefers not to use solid implants for lip augmentation. I have heard about silicone injections for lip augmentation, is this safe? Silicone (silikon-1000) is a pharmaceuical product that is used by retina surgeons when performing surgery within the eye. Since it is FDA approved, it can be purchased and used by physicians for off-label purposes. 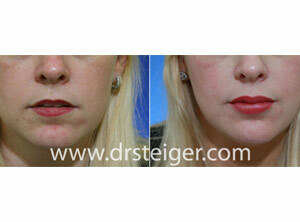 There are research studies that show silicone, when used properly, is safe and very effective for lip augmentation. It can also lead to very natural results. If you seek lip enhancement with silicone, it is very important to choose a reputable facial plastic surgeon that has experience with this product and only uses silicone obtained directly from the US manufacturer. Safety must be the number one concern. Absolutely… Like all plastic surgery procedures, excellent results are a combination of both science and art. Simply injecting a lip filler will not look good. A disciplined specialist should achieve a balanced and propotionate lip through very specialized techniques. Many of our patients fly in from out of town for lip augmentation in order to achieve the results they are looking for. I am flying in to have this done, how long will I have to be in town for? When flying in for lip augmentation, you will only have to be in town for one day. Many of our patients choose to come in and stay for several days to enjoy the beautiful climate and environment that South Florida has to offer.